In June of 1999, the 100-acre property in the immediate view of the adobe sold after a century of ownership by the Grisingher family to the Patterson Academy who applied for a General Plan Amendment to build a private school on the agricultural zoned land. Though the representative of Patterson worked with the community in various design options, there was no practical way such a project could avoid profound impacts to the view and to the property’s agricultural and historical resources. With delays and challenges in the bureaucratic process, the Patterson Academy application was withdrawn and the property was placed on the open market in 2004. In January of 2005, local developer, Dan Pace, entered into an escrow agreement to purchase the property for approximately $2.5 million to develop several homes for his own family. DANA board members met with Mr. Pace, and initially discussed ideas for clustering the homes in the northeastern corner of the property, (under existing zoning, he was legally entitled to build three homes across the entire property with secondary residences, and support buildings). The cluster/open-space option was a compromise, but the best option available. After several weeks of discussion, Mr. Pace sent a message to DANA that opened the door to the complete protection of the property. He knew that although he would be a good neighbor to DANA, he did not want to be the neighbor who compromised DANA’s vision and so he generously offered to transfer his escrow agreement to DANA. For this community minded gesture, we are forever grateful to Mr. Dan Pace, his brother Scott, and his entire family. The next three years were a series of quick lessons for DANA (a small non-profit organization–omit) to come up with over $2.5 million. Fortunately, the same development boom that transformed the small town of Nipomo now helped contribute to the protection the Dana Adobe landscape. The County requires development fees to support a fund for parks, recreational and open spaces, called “Quimby Funds”. The same year Nipomo Attorney Jesse Hill negotiated a settlement with the County to insure Quimby funds from development in Nipomo would return to be used in Nipomo. In December, 2005 with superior leadership from Supervisor Katcho Achadjian and support from parks Superintendent Pete Jenny, the Supervisors allocated one million dollars in Quimby funds toward the $2.5 million acquisition of the 100 acres property adjacent to the Adobe. This funding commitment transformed a hopeful idea into the realm of reality. Still, DANA needed time to raise the rest of the funds to successfully protect purchase the property. When businessmen Rob Rossi, Karl Wittstrom first toured the Dana Adobe in February 2005 they immediately grasped the imperative of protecting the landscape around the Dana Adobe. In December 2005, Rossi, Wittstrom and Dan Pace agreed to become conservation guarantors by co-signing a loan with MidState Bank (now Rabobank) on behalf of DANA. On June 2, 2006, escrow closed and DANA went on title as the property owners. Carroll Pruett and Cathy Cachu of MidState Bank provided essential support in crafting the agreement that gave DANA two years to raise the additional funds and to pay off the loan. Without Dan Pace, Rob Rossi and Karl and Cindy Wittstrom’s loan guarantee, and the support of MidState bank. the dream to protect the land would have ended. The next two years turned out to be a cliffhanger. Several avenues were sought to secure the required additional funding. One promising option involved one year of work with countless meetings with public agencies and elected representatives. It was a huge disappointment when this option fell through just four months before the June 2008 deadline. Fortunately, there were great successes in the process as well. Land Conservancy Conservation Director, Bob Hill had been DANA’s primary project partner throughout this process. Hill successfully secured $715,000 toward the property acquisition from the Environmental Protection Agency, and $450,000 toward riparian restoration from the Guadalupe Settlement funds for the project. These allocations secured by Hill provided critical project momentum. However, still short of funds and with only a few months before the June 2008 deadline, DANA was forced to consider back up options such as partial acquisition. The acquisition was in jeopardy months before the final deadline. If DANA failed to repay the loan with the accrued interest, the property would revert to the bank and limited development could still proceed. When County Parks Superintendent Pete Jenny brought the Parks Commissioners to the Dana Adobe on a tour of South County area in February 2008, Jenny and the Nipomo Commissioner, Paul Teixeria, helped the Commissions see a golden opportunity. 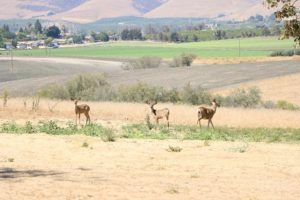 If they were to recommend the additional funds to complete the 100-acre purchase, the property would become permanently protected as county parkland. This would also free up funds so that the Land Conservancy could apply the $715,00 EPA funds to help purchase the adjacent property around the Adobe, creating a 126-acre public historical park. These same EPA funds would then become the match funding to support a $861,000 grant from the California Cultural and Historic Endowment (about half designated for Dana Adobe building restoration and the other half for the property acquisition around the adobe). Commissioners also saw that this allocation could move forward the Land Conservancy’s fully funded plans to plant 10,000 native trees and shrubs on the creek tributaries, enhancing the habitat and outdoor educational values of the historic park. Two months later, the parks Commissioners did vote unanimously to support this funding allocation, and one commissioner stated. “There are times when a special project comes along that transcends district or political boundaries, and this is one of those projects”. On June 3, 2008, the very deadline of the loan, with support from the South Community Advisory Council and Supervisor Achadjian’s leadership, the County Board of Supervisors unanimously approved the $1.7 million allocation; a few days later escrow closed, this time fully retiring DANA’s 2-year loan. The 100 acres became County parkland and will now and forever be a part of the Dana Adobe Historic Park. Every person you read about in this story is a hero. Every DANA member, every DANA volunteer and every DANA staff member is a part of the unfolding success story of the Dana Adobe Historical Park. Come by and enjoy the view, say thank you to one of the volunteers as you walk by. And, thank you for your continued commitment to DANA and for your ongoing support. We need you more than ever for the work ahead!